Many British readers will perhaps first encounter the concept of the Gothic, not through a Gothic novel, but through Northanger Abbey’s playful engagement with the genre’s key tropes. They will have perhaps, like myself, laughed at Catherine and Isabella’s famous discussion of the ‘horrid novels’ before reading any of these texts themselves. The latest exhibition at the British Library aims to redress this imbalance, introducing visitors to the darkest recesses of the ‘Gothic Imagination’. Planning my latest research trip to London, I found myself seized by an Isabella-Thorpe-like excitement at the prospect of the British Library’s new exhibition. Celebrating all things blood-curdling and ‘horrid’, Terror and Wonder: The Gothic Imagination traces the development of the Gothic as a genre and an aesthetic, all the way from Horace Walpole’s publication of The Castle of Otranto in 1764 to photographs of Whitby Goth Weekend taken during summer 2014. The exhibition manages that alchemy which British Library exhibitions seem uniquely capable of: bringing books and print culture artefacts to life within a museum setting. Using an array of different interactive displays, film clips, sound effects and art works, the curators place books and broadsheets in living, breathing context. The exhibition space looks very much the part; all billowing dark cloths, shadowy corners and dramatic directed light. My first look at the space was during the Library’s ‘Late’ on Halloween; filled with elaborately costumed actors and members of the public, the effect was really impressive. The first sections of the exhibition which look at Gothic’s development from the classic eighteenth century Gothic novel to the decadent fictions of the late nineteenth century have a clear narrative. The curators use key literary examples to take visitors from eighteenth-century novels, full of continental castles and mad monks, through the French Revolution’s political Gothic, on to the mist-robed streets of mid-Victorian London and then into the decadent fantasies of Dracula and Dorian Gray. The displays paired traditional Gothic texts with other texts and images which chart the public’s broader reaction to the Gothic as a genre. Caricatures of flushed and flustered lady novel readers, and accounts of contemporary supernatural phenomena, kept the exhibition from feeling too much like a catalogue of texts and placed them within a broader Gothic culture. After this, however, I felt that the narrative of the exhibition became less clear and compelling. The ‘Modern Horrors’ area felt rather diffuse and lacking in focus, as different displays covered everything from The Wickerman to Wallace and Gromit. I found it much harder to pull out the key tropes and themes in this section – although this perhaps just illustrates how diverse the influence of the Gothic on modern culture has grown. Martin Parr’s photographs of the ‘Whitby Goth Weekend’ at the conclusion of the exhibition were superb but did not quite succeed in uniting the different elements of the exhibition thus far. This diffuseness of content is perhaps a symptom to be expected in an exhibition with such grand aspirations. The scope of a project which aims to document the development of the entire ‘Gothic Imagination’ from 1764 to 2014 is so vast that it perhaps necessarily can feel unfocused. It is the ambition of Terror and Wonder that is simultaneously the exhibition’s Achilles heel and its greatest triumph. The accompanying catalogue goes some way to remedy this issue and chapters by scholars and artists as diffuse as Dale Townsend, Lucie Armitt and Martin Parr do an admirable job of contextualising and expanding upon the different stages of the exhibition. The examples of relevant visual culture in the catalogue are well-selected and beautifully highlight the trajectory of the exhibition. They also make an excellent teaching aid. I was leading a tutorial where I introduced the concept of the Gothic, the week after I visited the exhibition, and the illustrations in the catalogue allowed me to not just explain the idea of ‘the sublime’ to my class but to illustrate it. In sum, Terror and Wonder is another entrancing and exciting journey through literary history from the British Library exhibitions team. It acts as a great introduction to the Gothic genre, whilst still providing points of interest for visitors with more specialist knowledge. Few could fail to be caught up in the excitement and ambition of this project. I can also assure all concerned readers that it is all indeed quite ‘horrid’. 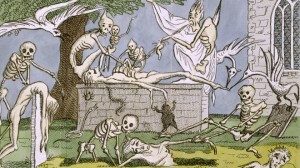 More details about visiting the exhibition are available here: http://www.bl.uk/events/terror-and-wonder–the-gothic-imagination.